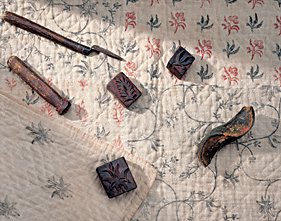 Fig 1: Detail of a cotton bedcover decorated with a design stamped [printed] with oil paint. Printed in red and blue, the brown stains from the oil binder are visible in and around the motifs. York County, Pennsylvania, between 1790 and 1820. Museum purchase funded by Jan Whitlock and the Centenary Fund (2007.4). Fig 2: This detail of a valance with stenciled decoration on white cotton velvet shows the sophisticated used of shading on the leaves and petals of the flowers. The color is applied by daubing with a short-bristled brush known as a scrub. Found in New England it dates to about 1830. Museum purchase with funds drawn from the Centenary Fund (2008.15.1). Fig 3: Detail of one section of a quilt made by Mary Ann Hoyt of Reading, New York, dated May 15, 1834. A stencil was used to decorate her quilt. The effects of dragging the scrub over the surface of the plain woven cotton fabric is clearly visible. Museum purchase (1959.22.8). Printed textiles can be characterized by the technology used to print them (block, copperplate, or roller) or by the “style,” which in this case does not mean the characteristics of the design but rather the chemistry that is needed to print the colors. One style of textile printing that is not very well known is the “pigment style.” Traditionally taken to mean the later nineteenth-century practice of printing pigments with an albumen binder, an earlier method of printing pigments with an oil binder (oil paint) has recently been identified on textiles printed in America (Figs. 1, 4).1 This earlier method of printing [or “stamping”] patterns on textiles with wooden blocks coated with oil paint is easily confused with the technique of stenciling, that is, the application of paint (more often tempera than oil) through a stencil (Figs. 2, 3). Most early texts on textile printing focus on the chemically complicated methods needed to print mordants and dyestuffs. One French manual, however, L’Art de Peindre et d’Imprimer les Toiles en Grand et Petit Teint, published in 1800 does describe a technique using colors “ground in oil” (broyées à l’huile).2 The carved wooden blocks that were used to stamp textiles with oil paint are very similar to those used to print textiles with mordants and dyestuffs. 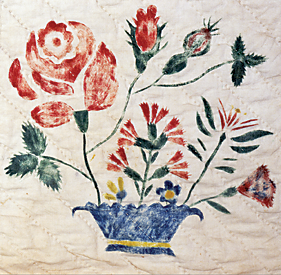 A stamped quilt survives in the Winterthur collection together with the wooden blocks used to create the patterns (Fig. 4). Dating to between about 1780 and 1815, the Waterman family quilt is made from various fabrics stamped by a family member who lived in South Scituate (now Norwell), Massachusetts. Analysis undertaken by the late Janice Carlson in Winterthur’s Scientific Research and Analysis Laboratory (SRAL) identified the red pigment as vermilion, the blue pigment as Prussian blue, and the medium as linseed oil, a drying oil often found in oil paint. Fig 4: Dating to between about 1780 and 1815, the Waterman family quilt is made from various fabrics stamped by a family member who lived in South Scituate (now Norwell), Massachusetts. The original stamps also survive, which could have been used individually or combined to produce more complex patterns. Bequest of Henry Francis du Pont (1964.551.1, .1, .3, .5, .6, .8, .11 and 1969.575). In the early nineteenth century the use of stencils for the decoration of walls, floors, furniture, and fabrics provided a quick and inexpensive method of decorating a variety of surfaces. The technique of using stencils to create colorful pictures was taught at many girls schools, including the academy operated by Mrs. Judith Foster Saunders and Miss Clementina Beach’s Academy in Dorchester, Massachusetts, who advertised “PAINTING BY THEORUMS on velvet silk and paper with practical in preparing the most brilliant colors, suitable for the same and the method of making the Theorems, Grooping [sic] Patterns, etc. etc. etc.” 3 Various manuals described the process of making stencils by oiling and varnishing paper to create stiff templates that could be cut to create separate stencils for each color in the composition. The color was applied using a brush with short, stiff bristles known as a scrub. How to tell the difference between block printing [stamping] and stencilling? Block stamping results in a flat color throughout the motif, often using lines and voided spaces to create the design rather than large areas of flat color. Sometimes the color appears to puddle at the edges of motifs, and where too much oil was used there can be halos of brown stains around the edges (fig. 1). Sophisticated stenciling involves shading of the color, achieved by applying more paint for the darker areas and less in the lighter areas, allowing the light color of the ground fabric to show through (fig. 2). Sometimes you can see a build-up of color at the edges of the stencil and the edge looks very sharp; the edges of stamped motifs often look softer or less definite.4 The sharpness of stenciled edges, however, is influenced by the nature of the fabric. Velvet, for instance, has a softer look because of the thicker pile (fig. 2). On fabrics without a pile, like Mary Ann Hoyt’s quilt (figs. 3), the edges are more defined. On this quilt you can see where she dragged the scrub across the surface creating the appearance of brush strokes. 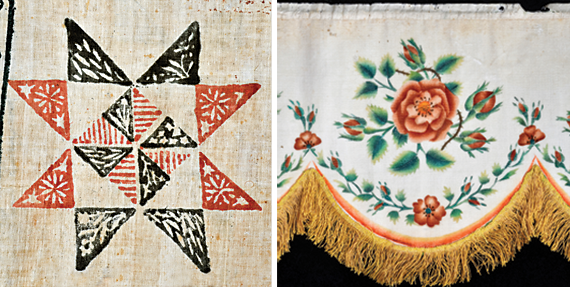 Very few stamped textiles have survived with a known maker or history of ownership. The author would be grateful to know of any examples, provenanced or not, that readers would be willing to share. Linda Eaton is the John L. and Marjorie P. McGraw Director of Collections and Senior Curator of Textiles at Winterthur Museum. 1. For a discussion of the various “styles” of textile printing see Martin Bide, “Technology Reflected: Printed Textiles in Rhode Island Quilts,” in Down by the Old Mill Stream: Quilts in Rhode Island, ed. Linda Welters and Margaret T. Ordoñez (Kent, Ohio: Kent State University Press, 2000), 88, 111. 2. L’Art de Peindre et d’Imprimer les Toiles en Grand et Petit Teint(Paris: Goeury, 1800), 139-40. 3. Nine Fletcher Little, Neat and Tidy (New York, NY: E.P. Dutton, 1980), 125 as cited in Alyce L. Perry, “For the Refinement of Ladies: An analysis of a velvet painted box (1961.1445) and its contents,” unpublished paper in the Registration Office, Winterthur Museum. 4. For other examples of stenciled bedcovers see Lynne Zacek Bassett “Stencilled Bedcovers” (The Magazine Antiques, February 2003): 70-77. For other examples of stamped textiles see Linda Eaton, Quilts in a Material World: Selections from the Winterthur Collection (New York: Abrams in association with the Henry Francis du Pont Winterthur Museum, 2007), 98-109.